Since fall is just around the corner for a lot of my lovely readers at the west, I came up with a transitioning into fall kind of a look which you can wear for the night time. I came up with this look using my stila In the garden palette which is got from asos.com. The palette is wonderful the formulation is so smooth and velvet like (Read my full review of this palette HERE). This look can defiantly be worn on other seasons too but it’s more appropriate during the night time. Let’s get started! 1 Apply an eye base and using a fluffy blending brush and the shade ‘freesia’ which is a royal blue shade with blue shimmers. 2 Next pick up the shade ‘rosette’ which is a rusted burgundy shade and apply it all over the lid area. 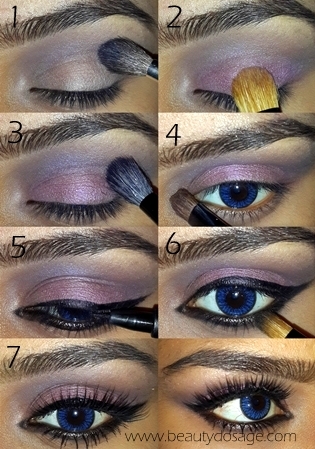 3 Now picking more of the blue shade, blend it in the crease again with a stiffer blending brush. 5 Now line your lower lash line with black kohl and upper lash line with a liquid liner winging it outside and also flicking out the inner corner for your classic Arab liner. 6 Pick up a matte black shade (I’m using one from the wet nwild greed palette) and smoke out your lower lash line a tad bit. 7 Finish up your look with falsies that are curved I find that such falsies look better on a fully lined look. Don’t forget to apply mascara to your lower lash line. Hope you guys enjoyed this look! You see more of my looks HERE. You eyes are like Bipasha's!